Today’s New York Times editorial . . .
Scanning a map of the world must give President Obama a sinking feeling as he contemplates the dismal state of troubled bilateral relationships his administration has sought to turn around. He would be smart to take a hard look at Cuba, where a major policy shift could yield a significant foreign policy success. In recent years, a devastated economy has forced Cuba to make reforms — a process that has gained urgency with the economic crisis in Venezuela, which gives Cuba heavily subsidized oil. Officials in Havana, fearing that Venezuela could cut its aid, have taken significant steps to liberalize and diversify the island’s tightly controlled economy. They have begun allowing citizens to take private-sector jobs and own property. This spring, Cuba’s National Assembly passed a law to encourage foreign investment in the country. With Brazilian capital, Cuba is building a seaport, a major project that will be economically viable only if American sanctions are lifted. And in April, Cuban diplomats began negotiating a cooperation agreement with the European Union. They have shown up at the initial meetings prepared, eager and mindful that the Europeans will insist on greater reforms and freedoms. The authoritarian government still harasses and detains dissidents. It has yet to explain the suspicious circumstances surrounding the death of the political activist Oswaldo Payá. But in recent years officials have released political prisoners who had been held for years. Travel restrictions were relaxed last year, enabling prominent dissidents to travel abroad. There is slightly more tolerance for criticism of the leadership, though many fear speaking openly and demanding greater rights. The pace of reforms has been slow and there has been backsliding. Still, these changes show Cuba is positioning itself for a post-embargo era. The government has said it would welcome renewed diplomatic relations with the United States and would not set preconditions. As a first step, the Obama administration should remove Cuba from the State Department’s list of nations that sponsor terrorist organizations, which includes Iran, Sudan and Syria. Cuba was put on the list in 1982 for backing terrorist groups in Latin America, which it no longer does. American officials recognize that Havana is playing a constructive role in the conflict in Colombia by hosting peace talks between the government and guerrilla leaders. Starting in 1961, Washington has imposed sanctions in an effort to oust the Castro regime. Over the decades, it became clear to many American policy makers that the embargo was an utter failure. But any proposal to end the embargo angered Cuban-American voters, a constituency that has had an outsize role in national elections. The generation that adamantly supports the embargo is dying off. Younger Cuban-Americans hold starkly different views, having come to see the sanctions as more damaging than helpful. A recent poll found that a slight majority of Cuban-Americans in Miami now oppose the embargo. A significant majority of them favor restoring diplomatic ties, mirroring the views of other Americans. The Obama administration in 2009 took important steps to ease the embargo, a patchwork of laws and policies, making it easier for Cubans in the United States to send remittances to relatives in Cuba and authorizing more Cuban-Americans to travel there. And it has paved the way for initiatives to expand Internet access and cellphone coverage on the island. Fully ending the embargo will require Congress’s approval. But there is much more the White House could do on its own. For instance, it could lift caps on remittances, allow Americans to finance private Cuban businesses and expand opportunities for travel to the island. It could also help American companies that are interested in developing the island’s telecommunications network but remain wary of the legal and political risks. Failing to engage with Cuba now will likely cede this market to competitors. The presidents of China and Russia traveled to Cuba in separate visits in July, and both leaders pledged to expand ties. Cuba and the United States already have diplomatic missions, called interests sections, that operate much like embassies. However, under the current arrangement, American diplomats have few opportunities to travel outside the capital to engage with ordinary Cubans, and their access to the Cuban government is very limited. April, Western Hemisphere heads of state will meet in Panama City for the seventh Summit of the Americas. Latin American governments insisted that Cuba, the Caribbean’s most populous island and one of the most educated societies in the hemisphere, be invited, breaking with its traditional exclusion at the insistence of Washington. Given the many crises around the world, the White House may want to avoid a major shift in Cuba policy. Yet engaging with Cuba and starting to unlock the potential of its citizens could end up being among the administration’s most consequential foreign-policy legacies. 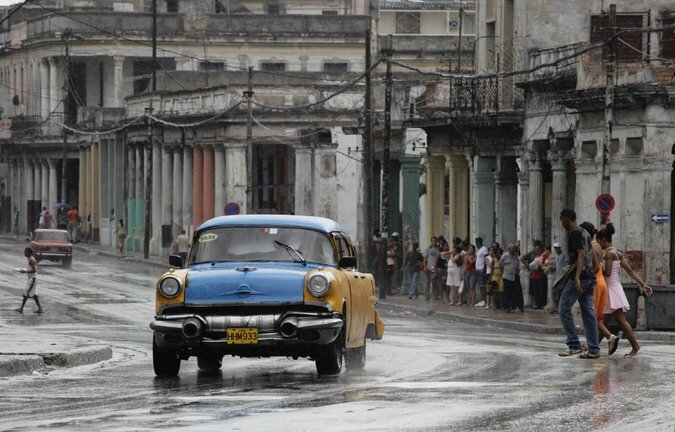 Normalizing relations with Havana would improve Washington’s relationships with governments in Latin America, and resolve an irritant that has stymied initiatives in the hemisphere. The Obama administration is leery of Cuba’s presence at the meeting and Mr. Obama has not committed to attending. He must — and he should see it as an opportunity to make history. ← In Rickety Boats, Cuban Migrants Again Flee to U.S.